My doctor confirmed at 34 weeks that Daphnée was in a breech position. This was my second pregnancy and, so far, the process was going extremely well. I gave birth to my son through vaginal delivery. I never thought that Daphnée could be delivered by a cesarean section. At 36 weeks, my doctor suggested to turn the baby manually. This technique consists in putting an external pressure on the baby to make her turn. With one hand, the doctor pushes the baby’s little bum out of the birth canal and with the other hand, he is pushing on the baby’s head. It is done at the hospital by an experienced doctor and a nurse. The baby’s heart rate and position are carefully monitored by ultrasounds. My doctor clearly indicated that we would only try a couple of times to turn the baby. He also indicated that because this was my second pregnancy, it would be easier to make the baby turn. My husband and I discussed this issue thoroughly and decided to try this technique. I knew that the success of the manipulation relied mostly on the softness of my belly. I also knew that the technique was painful but that it lasted only a couple of minutes. Before the manipulation began, I first calmed myself by using a very slow ocean breathing sound. My doctor then started the manipulation. It is rather difficult to explain how I felt, all my internal organs and my uterus were twisted, pulled and pushed in every direction. During the manipulation, I continued to use the ocean-breathing, but this time breathing out more loudly through the mouth. But what helped me out the most during this procedure was to focus my attention to the palm of my hands which were very soft. To my great surprise (and to my OBGYN surprise) it really helped to lower the number of contractions and their duration. The nurse who was assisting was also impressed about my attitude and calm. She said to me, "You are really in control" - I answered her back, "Absolutely not, I just accept the situation and let it be. If she turns that is great and if she doesn't, that is just as ok". I totally gave in and surrendered to the sensation. It really did calm me down and help me get through the painful minutes of the procedure. Despite our numerous attempts, Daphnée did not turn. 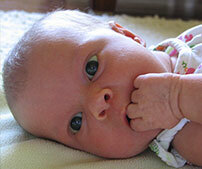 Two weeks later, she was born by a cesarean section. Although the experience was very much different than a vaginal delivery, I enjoyed and still cherish every minute of this wonderful experience.